The primary goal is to conduct research in the automated analysis of bio-electrical signals. The main focus is on electroencephalograms (EEGs) and evoked potentials (EPs, the brain’s electrical response to external sensory stimuli), although other electrophysiological signals such as the rapid eye movements during sleep stage REM and electromyograms (muscle activity) are studied as well. A 16-channel digital EEG machine (Biosemi) with active electrodes mounted in a flexible cap, EEG acquisition and analysis software (Vision Analyzer), and stimulus presentation software and hardware. There are numerous PCs for software development and analysis, and a laser printer. The computers and printer are networked, and have access to the extensive computing facilities of the College and the University. A separate sound-proof room is available for EEG recordings. At present, a large amount of work is focused on neonatal EEG analysis, and auditory evoked potentials analysis in schizophrenia, supported by grants from the National Institute of Health/Institute of Mental Health/Institute of Neurological Disorders and Stroke. 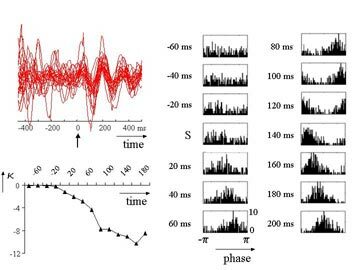 In the area of neonatal EEG analysis, a project is underway to develop techniques for the reliable automated detection of electrographic seizures in the neonatal EEG. While significant progress has been made in the automated detection of seizures in the adult population, relatively little work has been done in the neonatal area. The system being developed takes a multi-stage, hybrid approach to detection that employs a combination of signal processing, pattern recognition, neural networks, and expert rules. Through the successive stages of the detection process, multichannel neonatal EEG data containing all types of background activity and artifacts are analyzed to detect and classify electrographic seizures. Stage 1 detects short candidate seizure segments in individual channels. Artifactual segments are then eliminated in Stage 2, and the remaining candidate segments are clustered in time and across channels in Stage 3 to produce the final complete multichannel seizures. Collaborators on the project, Drs. Eli M. Mizrahi, James D. Frost, Jr., and Richard A. Hrachovy from the Dept. of Neurology, Baylor College of Medicine, serve as the expert electroencephalographers on the project and also provide data recorded from infants in the Clinical Research Center for Neonatal Seizures, The Methodist Hospital. The EP-related work concerns the development of advanced digital signal analysis tools for single trial EP analysis. Typically, EPs are obscured by the spontaneous brain activity (electroencephalogram, or EEG). Therefore, current practice involves ensemble averaging, resulting in a time-resolution of minutes at best. The methods proposed are specifically designed to take advantage of the newly emerging viewpoint that EPs are at least in part due to a phase reorganization of the ongoing EEG, rather than an independent component superimposed on the EEG. One such method, the Piece-wise Prony Method (PPM) has resulted from this work and is used to assess auditory information processing differences between normal volunteers and patients suffering from schizophrenia. 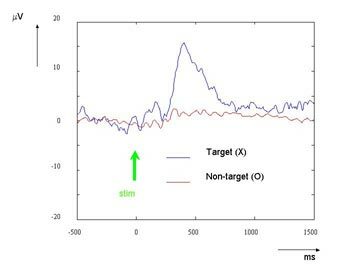 Ensemble averaged response to meaningful (‘target’) and non-target stimuli. The target response shows a large positivity (P300), peaking around 400 ms post-stimulus. We are also conducting a fundamental study of how the EP generation mechanisms through the use of aforementioned signal analysis tools and neural modeling. Another project aims at developing a brain-machine interface (BMI) to provide a communication option for those with severe neuromuscular impairments. The BMI will utilize the P300 component of the event related potential (ERP, the brain’s electrical response to external sensory stimuli). Measuring phase reorganization in single trial EPs. Top-left: Twenty single trials decomposed in the 4-8 Hz band by the Piece-wise Prony Method. Right: Phase histograms starting 60 ms before stimulus presentation. Bottom-left: Kuiper statistic as a function of time, indicating phase reorganization peaking arounf 160 ms post-stimulus. The P300 is a relatively large positive wave occurring about 300 ms following presentation of a ‘meaningful’ stimulus. Unfortunately, the need for ensemble averaging limits the communication speed to 1-3 char/min, but we believe this speed can be dramatically increased by relying on single-trial analysis methods such as the PPM.